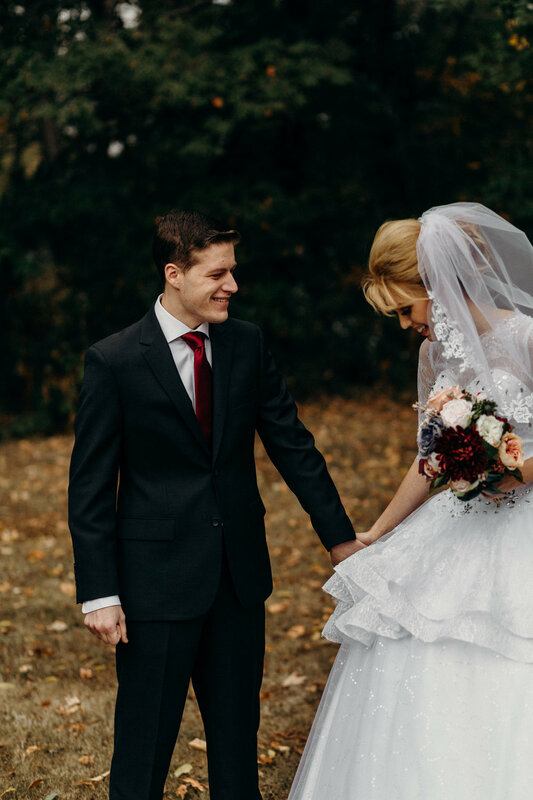 Fall coloring filling the leaves, stormy Ohio weather, floral wallpaper, and a Pride + Prejudice-esque dress (I mean…wait till you see it <3 <3 <3 GOODNESS) perfectly suited the style of these two’s small, intimate gathering on their wedding day. Handmade touches everywhere you look, many, many hugs, the people you love, and most importantly, your other half. Quiet, loved-filled days like Garrett + Nicole’s are at the heart of weddings, and we absolutely feel honored when we’re taken in like one of the family to capture the couple’s story. We’re so happy to have found friends in Garrett + Nicole, and can’t wait to see their many adventures in the future (most recently, getting their kitten, Sage, who we’re already obsessed with, obviously). We’re excited for the many, many evenings of board games and stuffing our faces with dessert to come with you guys. Without further ado, here’s Garrett + Nicole’s beautiful wedding day.